Nose-in angled parking is old hat in these rented spaces on Water Avenue. Around the post office, it will be of the back-in type. 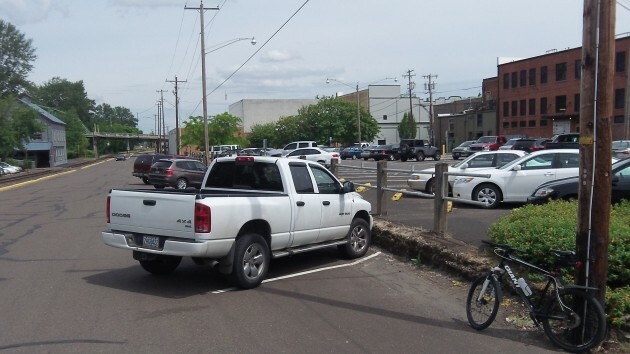 Diagonal parking spaces are coming to one side of three streets around the Albany Post Office, and the city’s urban renewal advisory board decided Wednesday that the new spaces will be of the back-in type. Back-in angled parking is said to be safer than the nose-first type, especially for passing pedestrians and cyclists. Also, drivers are supposed to be better able to see traffic as they pull out. The angled parking direction was decided as the board of the Central Albany Revitalization Area endorsed a staff proposal to set aside $650,000 to redo three blocks around the post office. That includes sidewalks, curbs and gutters, new pavement, and street trees, with the work to be done before completion of the new Albany Carousel building next year. All together, the changes will result in 50 diagonal spaces on three sides of the post office, according to drawings shown to the board. That’s 19 more than would exist without the CARA action, the board was told. Councilman Ray Kopczynski had qualms. He worried about drivers blocking traffic behind them as they prepare to back into a diagonal spot. But Councilman Bill Coburn said this would be no worse than drivers stopping in order to parallel park. ¶ If you’re wondering about the CARA business that was the subject of Tuesday’s story here, the board voted to approve two contract extensions, one of six months for the Lepman project on the old Fortmiller Building at 420 Third Ave. S.W., and the other until 2020 for completion of the 60-home Edgewater Village project off Water Avenue. But the board said at least one Edgewater dwelling facing the river must be completed by the end of 2017.